The EON Foundation provides a global forum for advanced, interactive, experiential and mobile learning; to teach skills, inspire creativity, foster excellence and spark collaboration between people of all nations and languages. John Eyles - Chair EON Foundation. EON supports Looksy with prize sponsorship, mentoring and spreading the word. Enabling teachers to use and teach through mobile technologies. Hosted by EON Foundation New Zealand. 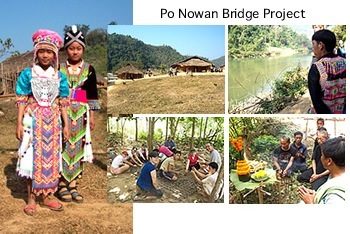 EON is supporting a community project in Laos through online games and social media. UPDATE: Land for the education centre has been secured and the first buildings completed. Next step is to find funds to put in satellite internet and a wireless mesh network. 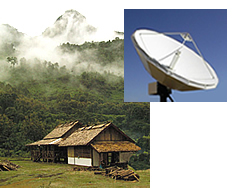 Here are the first buildings of the community lodge and education centre in the Seuang River Valley Laos and proposed two way satellite internet broadband. EON was a primary sponsor of the Future of Learning in a Networked World 08 Open Space Conference, helping to organise the Thailand leg. View details. Symposium 2 - A Professional Development Space for Teachers of English everywhere to share, discuss and invent how best to use digital media to teach English in a mobile and networked world. Advancing Sustainable Development through innovative integration of English Language Learning, Visual Literacy and Information Technology. Projects International was a forerunner to the Living Classroom. While the site is no longer updated the following links to useful resources on Youth Projects for Sustainable Development. EON is a visionary organization with pragmatic objectives - to grow the capacity and speed of human beings to learn together, for the highest good of all - and to benefit our planet for aeons to come. 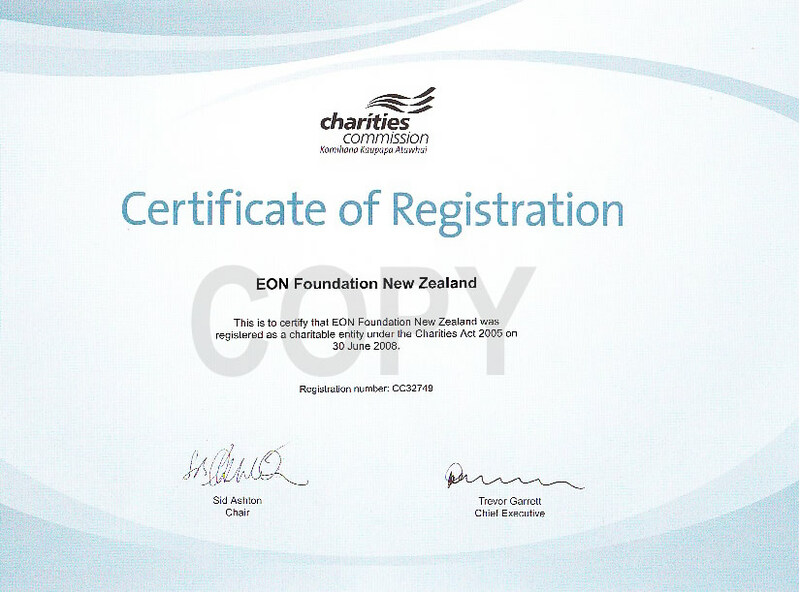 Founded in 1998, EON is a registered charitable entity in New Zealand. It has an Advisory Board and increasing numbers of supporters from around the world who share a common philosophy, commitment and intent. Our vision includes the intelligent use of technology to access the best in effective learning systems and harness the potential of distributed groups. In an increasingly complex world, we strive for elegant and creative solutions to connect people and communities through new technologies and communication skills. We believe good communication is a requisite for collaboration and the creation of workable solutions to pressing issues facing us and our planet. October 2012: John Eyles from EON will speak at the JALT Conference in Japan. He will be running a workshop where he introduces case studies from Projects International and talks about service learning and project work outside the classroom. August 2012: Graham Harper from EON pilots new 5 Steps curriculum model for Projects International with teachers in SouthEast Thailand. July 2012: EON starts projects in Myanmar (Burma). June 2012: Planning meetings held about the reinvention of Projects International. May 2010: 100 metre span bridge is in use. Built with the help of students from around the world. Background to the bridge: Graham Harper tells the story of how the bridge project came about. A short introduction from Graham to the Seuang River Experience Project that aims to create sustainable livelihoods for 12 villages in partnership with schools and colleges around the world. October 2008 - Graham Harper organised a book party in a small village near Luang Prabang, Laos - sponsored with money donated by FLNW2. It was by all accounts a great success. You can view photos, watch a short farewell video and listen to a Skype recording from Graham describing the event. August 2008 - Wang Song from Guizhou in China completes his Phd Research with support of the Living Classroom Moodle platform. July 2008 - Novia Ludwig and Lisa at BarCamp Auckland 08. Ludwig organised a very successful young web developers event, helped in part by EON sponsorship. View details. April 2008 - EON trials the use of solid state Mini PCs from Asus in Laos project work. Graham Harper, Darunee Khamjan and John Eyles with a mini PC that comes complete with webcam, wifi, open source software and Linux operating system. January 2008 - Suranaree University of Technology Thailand, Thailand TESOL conference and the wider FLNW2 participants. View details. December 2007- EON continues to work with Michelle Lee and Poutini Productions in supporting the Virtual Paa project. November 2007 - EON New Zealand supports Ymedia and the Ymedia Challenge - linking young media designers with charitable organisations needing media savvy. View details. September 2007 - EON New Zealand is awarded funding from FLinNZ for development of introductory education resource around Kapa Haka/Waiata and celebration of Maori songs. View resources. August 2007 - Graham Harper of EON Foundation Thailand presents workshops on the solidarity economy in Thailand for the Asian Forum in Manila, Philippines. 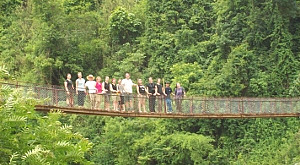 June 2007 - Linking Hands Across the World. EON runs learning day workshops with sponsorship from FLiNZ, with a focus on Podcasting, digital story telling and multicultural project based learning using mobile and networked channels. March 2007 - John Eyles of EON New Zealand spends three weeks in Abu Dhabi, UAE with Synapsys Ltd, developing a Learning and Development Strategy for Mubadala in Abu Dhabi. January 2007 - Living Classroom '2 Day Workshop on the Practical Application of Technology in English Language Teaching'. Suranaree University of Technology, Thailand. October to now - EON Symposium2: Teaching English in a Mobile and Networked World. September. 2006 - The Future of Learning in a Networked World - EON hosted part of this week long event on Waiheke Island. CSRSME Asia, through the generous funding from the Charles Leopold Mayer Foundation, is conducting a review of innovative 'solidarity economies' initiatives in five Asian countries. Graham Harper, of EON, is conducting the review in Thailand by focusing on community-based tourism initiatives assisting entrepreneur skills development, economic independence and poverty alleviation. The study aims to: (1) describe the characteristics of the innovation initiative; and (2) use lessons drawn from the initiative to support expansion of its outreach in domestic and regional (Asia wide) markets. June. 2006 - John Eyles led an 8 day EON workshop and seminar series at Suranaree University of Technology, Thailand on using Moodle and social software tools for English language learning. March. 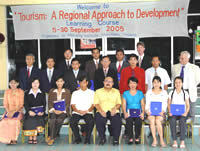 2006 - With help from the staff at Mekong Institute, EON delivered an ICT and Tourism course to senior tourism officials from the 6 countries of the GMS (Cambodia, China, Laos, Myannmar, Thailand and Vietnam) via live internet based videoconference and free Open Source learning management software. November. 2005 - EON and tourism professionals from the GMS have set up a website to share information and conduct training on ICT and Tourism, particularly sustainable community based economic development. The next workshop will be held at the Mekong Institue February 23rd and 24th 2006 in Khon Kaen and supported with an online component delivered through the Living Classroom Network and www.gmstourism.info website. August. 2005 - EON launches the Anuwath Appeal. Supporting Anuwath High School, National Institute of Education, Phnom Penh, Cambodia to become an education leader in promoting sustainable development through the innovative use of technology and English for international communication. June. 2005 - Winners of the Life along the Mekong Photo Contest announced. View the winning photos here. May. 2005 - EON Trustees Dr Howard Scott and John Eyles meet His Excellency Nguyen Minh Hien, Minister of Education, Socialist Republic of Viet Nam in Auckland, New Zealand. His excellency concluded his address by saying he supported the work of the Living Classroom. April. 2005 - EON makes a study of internet cafes as education portals along the Mekong River in Laos, Cambodia, Vietnam and Thailand. March. 2005 - EON Trustee Merin Waite from the British Council in Singapore and John Eyles present a joint paper on the Mekong Living Classroom project at the first CamTESOL conference in Phnom Penh, Cambodia. March. 2005 - John Eyles spends time with the Chair of English and the 'Education without Borders' unit at Suranaree University of Technology in Thailand to discuss and share open source learning management software know how and the use of wiki as a language teaching tool. March. 2005 - Auckland University of Technology, Kodak NZ, Nokia, Swatch and Kathmandu support research into the use of Wiki and open source technology to extend photoreportage methodology. The aim is to develop an affordable and effective digital channel for community based visual literacy for use by the Living Classroom Network and elsewhere. February. 2005 - ASEAN New Zealand Combined Business Council in association with AUT’s Centre for International Development and Laos – New Zealand Business Development invite EON Trustees Howard Scott and John Eyles to a reception in honour of His Excellency Kenthong Nouanthasing, Laos Ambassador to New Zealand and Australia. The event provided an opportunity to update the Ambassador on the Living Classroom initiative in Laos. Sept. 2004 - His Excellency Mr Ong Keng Yong, ASEAN Secretary General met with John Eyles and members of the Living Classroom team at Auckland University of Technology, September 13th 2004. John presented the Mekong A Living Classroom to Mr Ong and had fruitful discussions on how the activities of the Living Classroom can be expanded throughout the ASEAN region. June. 2004 - EON launches the pilot version of the 'Living Classroom' supporting website with schools in Laos, Cambodia, Thailand and New Zealand. More info .. .